The CDC’s investigation of Chipotle is over and their final verdict is in: The outbreak is finished, but the agency has no idea what caused it. So...what exactly does that mean? 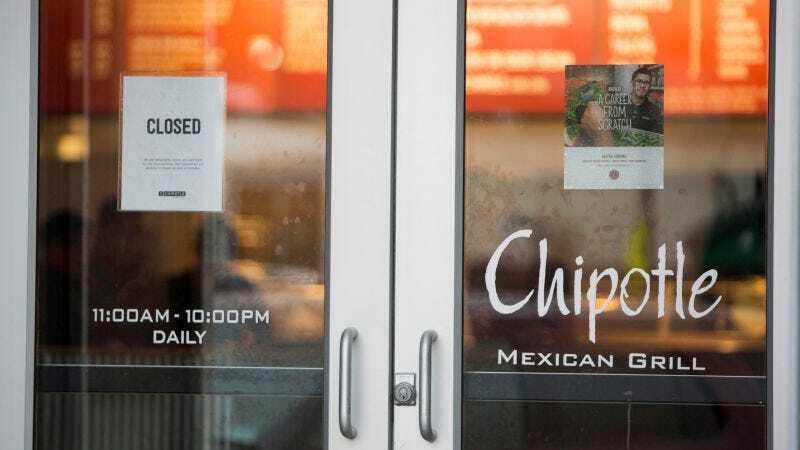 The CDC shut down the investigation early this afternoon, saying that it had been two months since the last confirmed case of E. Coli linked to Chipotle and the outbreak appeared to be over. What the news didn’t come with was any determination of what was behind the outbreak. Investigators still believe it came down to a single ingredient, but what that ingredient was remains a mystery—one the CDC doesn’t expect to be solved. So how do you close an investigation without knowing what happened?Essentially, there are a couple different an investigation like this one can end. The most satisfying way is, of course, to find the cause. But sometimes, when no cause is found, an investigation can end when the outbreak has. In this case—despite genome sequencing of the bacteria, data analysis, and frequent kitchen testing—the contaminated ingredient remained elusive. Although that may seem alarming, not knowing the cause in food-borne outbreaks is actually quite common, and there are some good reasons why, according to Michael Doyle, a professor of food microbiology at the University of Georgia. “It’s frequent,” Doyle told Gizmodo, “in large part because not all outbreaks can be fully investigated because there’s so many thousand or more a year.” Of course, some of the problem is specifically to do with E. Coli being a notoriously difficult bacteria to track, due to the long gap between when you eat it and when you get sick. That was one reason the CDC waited so long after the last known case—it takes at least three weeks to confirm a case, and often longer than that. But if the outbreak has stopped, as the CDC says it has, is not knowing the source really a problem? It is—especially when it comes to predicting future outbreaks. With this investigation closed, and the outbreak hopefully over, the cause of Chipotle’s particular strain of E. Coli looks likely to always remain a mystery. Enjoy that burrito!